taylor dinerman | Pleasant's Personal Blog! 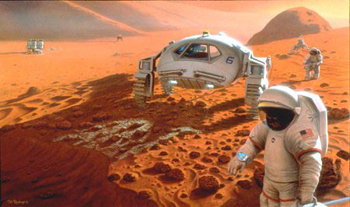 New guidelines for NASA have been proposed by the United States government considering the exploration, scientific and technological projects for the next few decades. This paper evaluates the key aspects of President Obama’s Space Policy of 2010 and Justin Kugler’s article on how the end of the Space Shuttle Era is not the end of NASA (Kugler 8 Aug 2011) with conclusion on the future of NASA considering the current economic and political scenario. 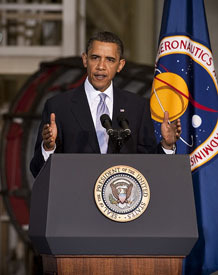 The Space Policy, 2010 of President Obama is reminiscent of Kennedy’s speech on Urgent National Needs except that the goals mentioned are more ambitious as well as challenging in terms of technology, economy and politics. This policy that aims at reinvigorating US leadership in space has far reaching implications and takes into account the overall multidisciplinary nature of space sciences and technologies. His Civil Space Guidelines (Space Policy 28 June 2010) is particularly attractive in that it sets ambitious human exploration milestones as goals like crewed missions in trans-lunar space by 2025 and to Mars by 2030. 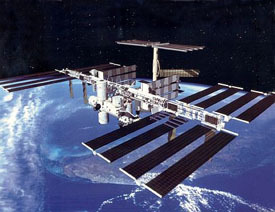 The policy’s decision to operate the ISS for another decade and beyond and to seek partnership between NASA and private space agencies and encouraging prize competitions in development of various projects like the “Three New Centennial Challenges”(E. Steitz 13 Jul 2010) of 2010 is excellent and positive. Design and build the proposed SLS, heavy lift launch vehicle(Weaver 14 Sep 2011) that is expected to carry the Orion Multipurpose Crew Vehicle in addition to other important cargo, equipments and science experiments to Earth orbit and beyond. This project is a technological challenge that can be achieved only after sufficient funds pour into NASA from the government budget. Detect, track, catalog and characterize N.E.O to mitigate human hazards from an unexpected impact and also identify potentially resource rich planetary objects(Space Policy 28 Jun 2010.) This currently can be done using the existing technology. However, for unmanned/human exploration of asteroids, development of SLS or any such vehicle is required. It is hence imperative to enforce the guidelines mentioned in Obama’s policy independent of the Congress and with collaboration from the private sector so that appropriations of proper funds can be done to make technological and economic progress in the space sector as envisioned in the policy. Justin Kugler sees some of the positive aspects of NASA’s latest policy as well as the current US space scenario which otherwise appears a threat to national security after the end of the shuttle era (Dinerman 1 Aug 2011.) NASA, US government and international partners’ decision to extend the current life of ISS till 2028 (Kugler 8 Aug 2011) despite negative comments from Roscosmos chief Vitaly Davidov about its deorbiting is positive but the possibility of leaving ISS unmanned for sometime after the current astronauts are returned on November 22 due to delays in Soyuz from Roscosmos is not very promising. Phasing out of the space shuttle has indeed created launch issues since US has to currently depend entirely on Russia to get astronauts including American astronauts to the ISS (Leonard 16 Sep 2011) and hence without a new and improved heavy lift launch vehicle and the Multipurpose Crew Vehicle derived from Lockheed Martin’s Orion as described in Obama’s Space Policy 2010, NASA’s own human spaceflight to ISS might be halted for a long time. Both Obama’s Space Policy 2010 and Kugler’s criticism of Dinerman’s article (Dinerman 1 Aug 2011) point out two key aspects influential in the space arena viz lack of funding and political interference. The space arena is no longer bipolar but is multipolar with fast growing economies eying space-exploration and/or space resource utilization. It is hence important for NASA and the US government to create new laws that will allow technological development and cooperation between nations as well as public and private sector space agencies. 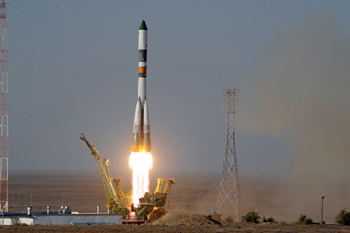 The recent crash of the unmanned Russian cargo spacecraft (Wall 1 Sep 2011) indicates that the Soyuz rocket may not be dependable in future. Unfortunately, Soyuz is the only crew-carrying vehicle available and hence it is imperative that with retirement of the Space Shuttle fleet, private American companies should take over the role of Soyuz to take astronauts to the ISS. It is good news that the agency has given money to SpaceX, Boeing, Sierra Nevada and Blue Origin under its Commercial Crew Development program. As discussed by Kugler, the development of crewed vehicles by these private agencies will generate sufficient competition and cooperation between the traditional and new age space agencies to create low cost access to space. Cooperation and joint ventures in space exploration should be the next generation goals of NASA and its partners under the current national economic constraints. Obama’s Space Policy does include international cooperation in space as one of its goals (Space Policy 28 Jun 2010) . However, for reaching the goals described in the Civil Space Guidelines described in Obama’s Space Policy, NASA must increase its budget. 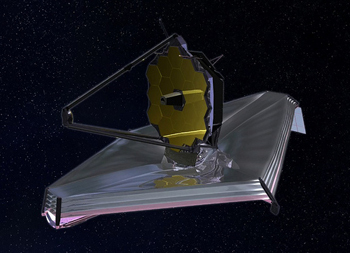 The current budget cuts of NASA (K. Mathews 10 Sep 2011) and other impending cuts has essentially jeopardized many projects like the James Webb Telescope and other futuristic Mars sample return spacecraft development. Even the proposed 2012 budget of 18.7 billion dollars (Weaver 14 Feb 2011) may not be sufficient in developing the SLS or the Multipurpose Crew Vehicle while continuing with the existing space science and technology based projects. 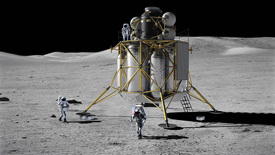 Since NASA cannot expect immediate returns from cutting-edge space exploration for the huge investment they require when compared to production and launching of satellites, private enterprises may not be interested in contributing to cutting-edge space exploration thereby pressurizing the government to bear costs of missions to Moon, Mars and beyond. However, as a democratic nation, the government must appease its taxpayers. America’s national debt is currently close to $15 trillion (Knoller 22 Aug 2011) and annual deficit at over $1 trillion (CBO Aug 2011.) The budget call for billions to develop SLS and MPCV (Leone 12 Sep 2011) is against these numbers. In the midst of this economic debt, it is difficult for the nation to quantify the cost of going to the Moon and Mars. To conclude, NASA is currently treading on a difficult path with higher goals and equally high economic and political constraints. Considering these constraints, NASA must outsource more components of its various projects or even entire projects to private agencies where immediate financial benefits can be reaped. In cases where the benefits are only long term, international cooperation must be in place. For instance, just like cooperation in orbital debris removal projects, NASA can collaborate with ISRO, CNSA, Roscosmos, ESA and JAXA in trans-lunar and Martian missions since that way, the cost can be shared in addition to the benefits among the participating nations. With privatization and international cooperation, scientific and technological endeavors of NASA will have a bright future. Kugler, Justin. “”Avoiding “the end” of NASA.”” The Space Review, 8 Aug 2011. Web. 17 Sep 2011. NATIONAL SPACE POLICY of the UNITED STATES of AMERICA. June 28. 2010. 11.